This morning has been bad for the global equity markets. We’ve had a few earnings reports from industrial stocks that are showing cracks in the bullish thesis. Stocks are down; some even on good news. Some stocks like Intel (NASDAQ:INTC) have been struggling for months. INTC stock is down more than 20% since the June highs. If this was all stocks, Wall street would say we were in a bear market. But the broader market dips are self-inflicted wounds emanating from the tariff war with China and the fear that the U.S. Fed is raising rates too fast. Both of these are things that the U.S. can control when they decide they need to, however. Meanwhile, INTC stock has set lower highs and is now testing the $44 per share zone. So far it has held but if it fails, Intel could fall another $3 from there. In this case, the falling stock doesn’t indicate a broken company, however. What helped drive this stock price down was the confusion in the c-suite and the rise of the popularity of its rival Advanced Micro Devices (NASDAQ:AMD). As Intel was falling, Wall Street was falling madly in love with AMD and perhaps too much so. I still favor Intel over AMD because I am a value investor, and Intel actually has some. Meanwhile, AMD still runs red. INTC stock is down 6% year-to-date while AMD is up 125% for the same period. Regardless of who’s running the company, Intel is a long-term survivor and has dominated the semiconductor sector for decades. So it’s a proven management team that is likely to overcome any short-term hindrance. 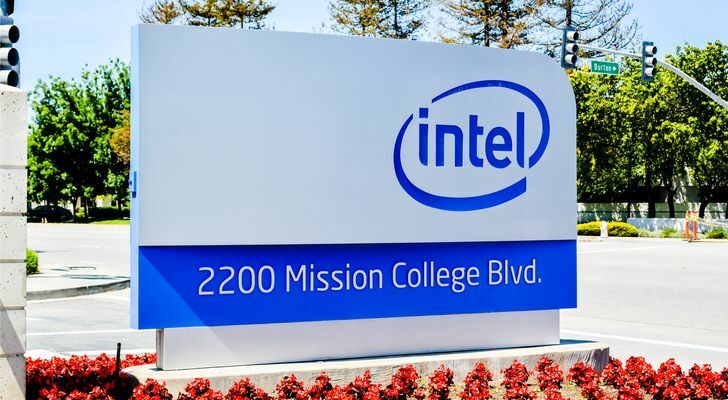 The outlook for INTC stock is still attractive. So this dip in the middle of 2018 is an opportunity to build a position INTC for the long term. The macroeconomic conditions still favor the bullish thesis. But there are short-term threats. The Federal Reserve seems intent on raising rates regardless of the data so they can actually damage the stock price action this year. Furthermore there’s technical threat from the indices. If this test of the recent lows doesn’t hold, the S&P 500 could fall quickly to 2600. While this is not a forecast, it is a scenario investors need to be aware of. If that happens all stocks will fall, including INTC. So I am ready to take some red into a position of a stock that has value. Fundamentally, Intel stock is cheap. It sells at a 12 price-to-earnings ratio. Compare that to Nvidia (NASDAQ:NVDA)’s 35. There’s also the Intel earnings event threat. The short-term reaction to earnings is always binary regardless of the quality of the report. Even if we know the company results ahead of time, we cannot forecast how investors will react to it or what they will say during the call. As long as I’m not buying Intel stock at market tops, I am confident that the stock will be higher in the long-term if stocks in general are higher. We now live in a highly technical world and this trend is only accelerating. Intel is one of few companies that supply the brains to the operations. Computers are still in high demand and they are in almost every product we buy these days. Furthermore, all the services that we use are web-based if not they are aiming to be web-based soon. Those also will demand computing power. So, the dominant companies in this field will remain dominant for a long period of time. The bottom line is that Intel has been a leading provider of semiconductors and will continue to be so for the foreseeable future. Article printed from InvestorPlace Media, https://investorplace.com/2018/10/buy-intc-stock-with-confidence-ahead-of-earnings/.